I am on the Newton’s Nook Designs blog today with a clean and simple thank you card featuring the Flower Trio die set. Finally my long awaited package from Simon Says Stamp has arrived and I had a chance to play with the gorgeous Pearl Alcohol inks. I tried my favourite colours first: Celestial, Villainous and Enchanted. I added drops of them on Yupo paper and used a felt applicator and blending solution to mix them with a dabbing motion. When I was happy how it looked I set it aside to dry. Then I created my flower embellishments from purple and pink cardstocks. I love that stitching detail on the flowers! I added a smaller white one in the middle and a gem in the middle for a layered look. I also die cut 2 white leaves. When my alcohol inked background was dry I cut it down and matted with a slightly bigger black cardstock piece and adhered it at an angle on a top folding white notecard. I white heat embossed a sentiment from the Floral Fringe stamp set on a thin strip of black cardstock and glued it to the background. I arranged the flowers above the sentiment and used 3D foam squares to attach them on the card. I left the leaves as the last step, I simply tucked them under the flowers. I hope you liked my card today and will come back later for more inspiration. I am back today with a clean and simple card design using goodies from LDRS Creative. The pretty Peek-a-boo Autumn Breeze background die makes a perfect clean and simple card with the oval cut in the centre for your sentiment. This is such a beautiful die, can easily be the star of the card on its own. To take it to the next level, I will show you a trick. I started with die cutting this gorgeous background from a specialty gold cardstock. For easy handling I used washi tape to hold the oval die in the middle. I love dimension on my cards so I die cut the same die another 2 times from dark brown cardstock. I layered them on top of each other and adhered it to a dark brown card base. It looks almost like a decorative chipboard with a golden finish! Then I die cut the oval from cream cardstock and stamped a sentiment from the Happy Fall stamp set using Coffee Bean Hybrid ink along with 2 little leaves from the same set. And here comes the second trick: I added some sparkle with a sparkle pen to the coloured leaves and went over the letters of Blessings too. As a finishing touch, I added two lines under the sentiment with the same gold sparkle pen and adhered the oval to the card. I hope you like today’s inspiration and you will try to stack up your dies for a dimensional look. Until next time, happy crafting! Yesterday was a special day for all card makers and I wanted to celebrate in style. I just went through my descent Lawn Fawn stash as it was the brand which hooked me into cardmaking. The Our friendship grows set was one of the first ones I purchased and it is a love forever. So for today’s card I stamped and coloured the sunflowers and some leaves using Copic markers. I used the coordinating dies to cut them out. I selected some patterned paper from the new Knit Picky Fall paper pad. I die cut one of them with a Reverse Stitched Scalloped rectangle die to create a frame. I layered dark brown and another patterned paper under it. I also die cut the word Thanks from brown cardstock using the Lawn Fawn Fancy box die set. I mounted the sunflowers using 3D foam squares and the leaves I adhered flat, just as the sentiment. To make this very simple card special, I added a lot of dark brown prills to the middle of the flowers using Ranger Multi Matte Medium adhesive. I love the texture it gives! 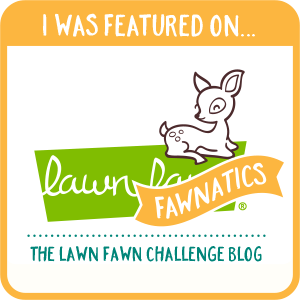 I will upload this project to the Lawnfawnatics Challenge #38: Awesome Autumn. I wish you enjoyed today’s post and you also managed to craft yesterday. See you soon with more projects. I am on the Newton’s Nook Designs blog today with a cute fall card, perfect for anyone you want to say thank you to. My card features several stamps and dies from Newton’s Nook Designs, I love to combine the newer sets with older ones for a different look. As always I started with stamping and colouring the images with Copics, I used the Deer friend and the new Harvest Tails sets. It is amazing how well these sets coordinate with each other! I used the coordinating dies to cut them out. Then I wanted to create a background for my scene. I die cut a stitched scalloped rectangle from light blue cardstock using the Frames and flags die set. I cut another peace from pale green too and used one of the Sky border dies to cut a bush. To give some interest and texture to the background, I stamped the words Thankful and Grateful from the Thankful thought stamp set with Sea Glass ink (Simon Says Stamp). It gave me a very subtle tone-on-tone look. I also stamped a sentiment from the Deer friend stamp set in black, to stand out. I assembled the card on a cream card base using liquid glue and 3D foam squares. I wanted a dimensional scene, so I added some more pumpkins here and there. I added glossy accents to their stems and emphasized the eyes of the deer with a black glaze pen. I hope you like my card today and will return soon for more Fall inspiration. I am struggling with a nasty flu but I could not give up on the yearly MFT Card Design Superstar contest, so I created this simple Fall card. I started with creating an alcohol inked background on Yupo paper using Fall colours. I mixed some greens, yellows, a drop of brown and copper too. When it was all dry, I treated it with an antistatic powder tool and black heat embossed one of the leaves from the Geometric Greenery stamp set 3 times. I used the coordinating die to cut them out. I die cut a double stitched rectangle from some specialty cardstock, matted it with a black rectangle and adhered it to a white card base. The sentiment is a stacked Grateful die cut, the upper layer I cut from shiny black cardstock to match the heat embossing. I popped up the 3 leaves using 3D foam tape, and my card is finished. I will upload this card to the above mentioned contest – in the last minute I think 😀 Next year hopefully I will plan ahead better. See you soon with my second entry for the contest. Today is the first day of the Newton’s Nook Designs September Release Sneak Peeks. This release is full of Autumn goodies, perfect for the season. We are showcasing the Newton’s Thanksgiving and Newton’s Cornucopia stamp/die sets along with 2 new and unique stencils! There is a lot to show you today, so let’s just dive in. For my first set of cards I stamped and coloured the cute images from the Newton’s Thanksgiving set. I stamped some extras from the chicken legs and pumpkins to fill the scene I had in mind. I used Copic markers for colouring and the coordinating dies to cut them out. Then I cut a wide strip of patterned paper and a thin one to go on top of it from a coordinating coloured cardstock. I wanted to create the same design just different layout so I adhered these to a top folding and a side folding A2 sized kraft card base. For the top I cut a scalloped border from Peacock cardstock (Sky border die set) and on both cards I Stamped the sentiments using a light brown ink. I arranged the images and adhered them to the card either flat or popped up with 3D foam squares. As a finishing touch I added some Fall coloured sequins and a bit of glossy accents. I started again with stamping the image from the Newton’s Cornucopia set on alcohol ink friendly cardstock, used Copics for colouring and the coordinating die to cut it out. I Gold heat embossed the sentiment from the set on a strip of kraft cardstock, and popped up the image above it using 3D foam squares. I added a gold mat to this panel and also a dark brown scalloped border (Sky border die set) as embellishment. For the side of the card I gold heat embossed the leaves from the set on a strip of Bristol Smooth cardstock and sponged several Distress ink colours on it to get the Fall feel. A few extra details with a white gel pen and a black glaze pen along with a drop of glossy accents finished this card off. For these cards I used the gorgeous new stencils. For the first one I applied Walnut stain Distress ink through the Tree Ring stencil, then I removed the stencil and added Antique Linen Distress ink over the whole area. I stamped a sentiment from a new sentiment set (will be revealed later this week) using dark brown ink and added glossy accents to the edges of the tree ring for a dimensional look. Very clean and simple design, perfect for all the men in our lives! For the last card I applied Carved Pumpkin Distress Oxide ink on a dark brown cardstock through the Pumpkin Patch stencil. I went back and added some green with a mini applicator to the leaves and vines and I covered the whole with Cosmic Glitter paste. After removing the stencil I washed it immediately under running warm water. When the paste was dry on the cardstock I trimmed it down a bit and adhered it to a kraft card base. I stamped a sentiment on a stitched kraft banner (Frames and flags die set) and adhered it to a smaller dark brown banner before I mounted it on the pumpkin background. I just love the shimmer and shine the glitter paste gives! Would you like to win the “Newton’s Thanksgiving” or the “Newton’s Cornucopia” Stamp Set? 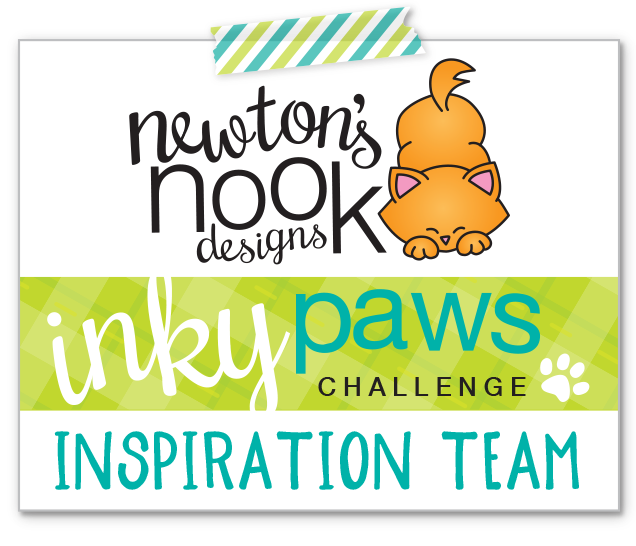 I hope you liked the first sneaks of the wonderful September Release from Newton’s Nook Designs. All products will be available on Friday, 14/09/2018 in the Newton’s Nook Designs online store and other big retailers. See you tomorrow for more fun sneaks!